Cathy at Rambling in the Garden encourages garden bloggers to cut something from their gardens or foraged nearby to bring inside to enjoy all week. I did bring some flowers inside to enjoy but they were mostly abutilons that needed to be pruned before coming out of the greenhouse and tons of Spanish bluebells. However, I worked in the garden until dark after work on Sunday and didn't feel inspired to try to do anything with the flowers sitting in vases in the kitchen. (Nothing like having an open garden in just a couple of weeks to motivate one to get things in order early.) 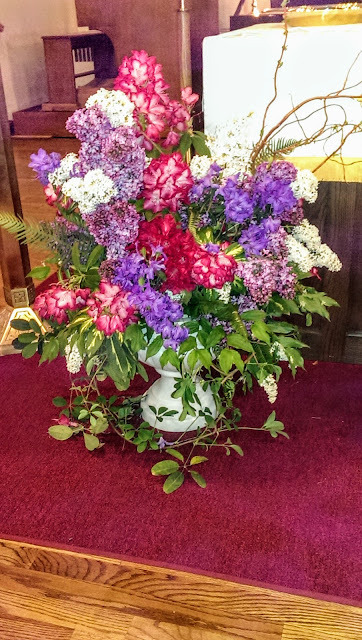 On Saturday, I sang at a funeral and was impressed with the flowers which weren't the typical stiff florist arrangements one often sees. 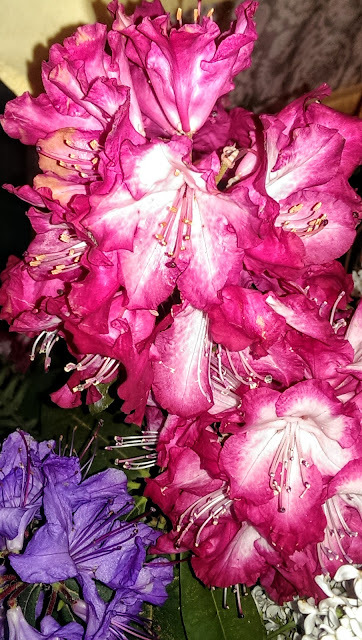 I didn't have my camera but did have my phone which takes horrible pictures, please forgive their quality..
'President Roosevelt' is one of my favorite rhododendrons not only for the white and pink flowers but also for the variegated foliage. Those in my garden just finished blooming. Our native sword and Akebia quinata around the bottom. 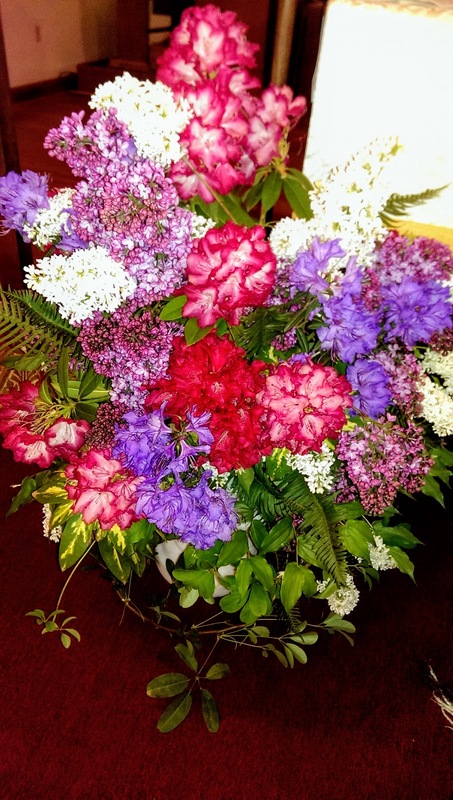 These were done by a friend of the family who used blooms from her own garden, which must be spectacular. 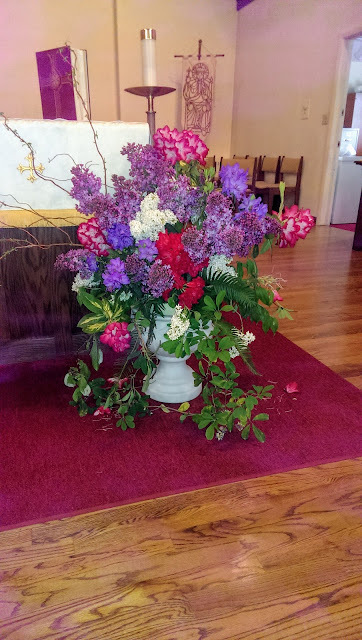 In addition, there were lovely small arrangements on all of the tables in the parish hall. Each of the small arrangements was unique and gorgeous. Unfortunately, I didn't think to snap pictures of them. 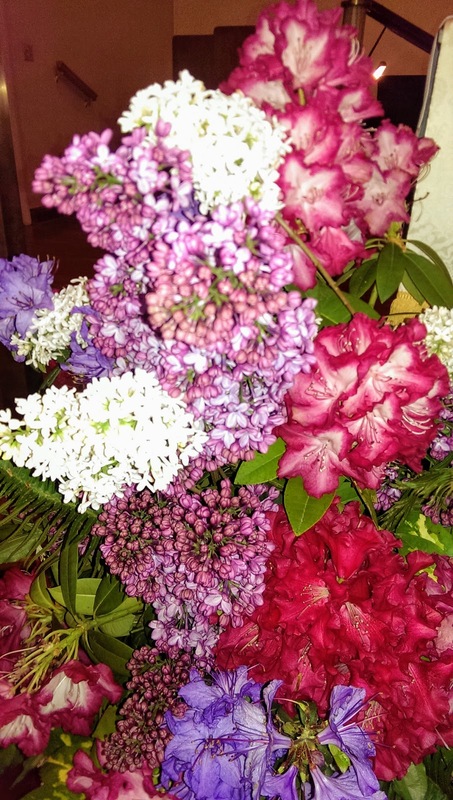 To see what other bloggers, especially those who didn't cheat, have put in a vase today, visit Cathy's blog. 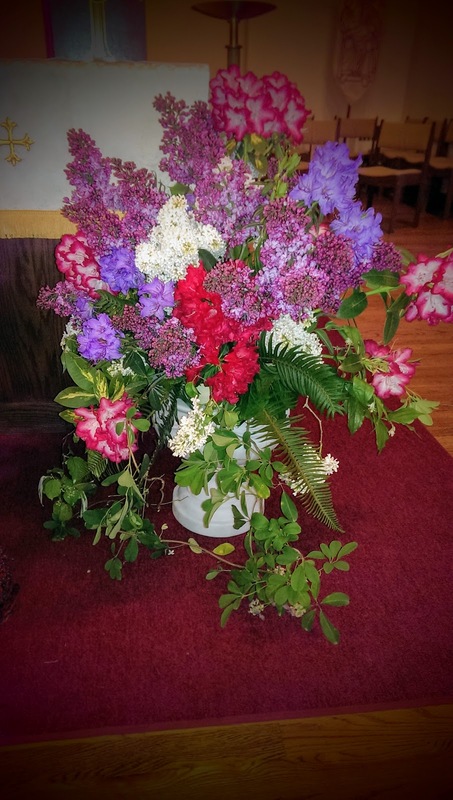 What and exuberant display! I also like you gradually zoomed out till the grand reveal. That is one spectacular display....they must have a fabulous garden.....I am glad you shared this very unique vase. That is an unusual arrangement. Thanks for sharing it. It must have come from a wonderful garden. The colors go with the stained glass window overhead too. These are really beautiful and such a change (for the good). I love the bold colours. Beautifully done - thanks for sharing them, Peter. Too bad the occasion was a sad one. 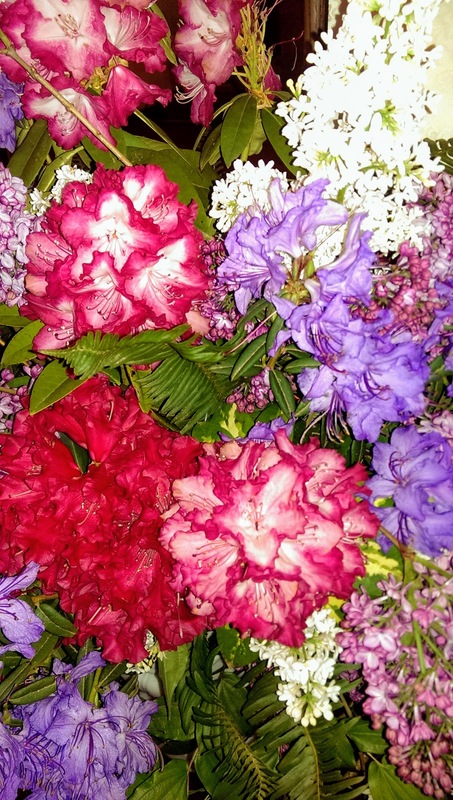 Oh, what an act of love those arrangements are! These arrangements are fabulous. It would be nice to have such large shrubs that you could make these huge arrangements. Well done. Nice to see. Happy IAVOM. And yes, we all should have a open garden a couple of times per year to get us focused on keeping up the garden. Remember to have some fun too. 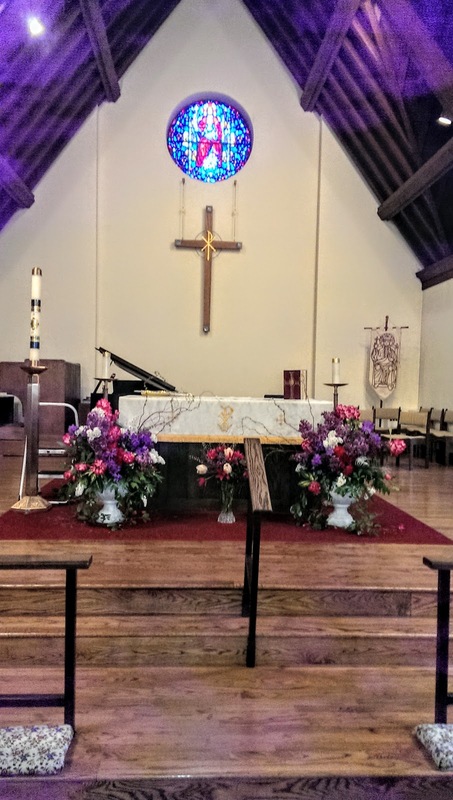 Those arrangements are beautiful. So personal and meaningful compared to the usual funeral flowers. It is so good when special flowers are used at funerals. When my MIL died in December 2016 I used foliage from her garden as the basis for the tribute on top of the coffin with just very few bought flowers; it made it very special for family and friends. You're allowed to cheat sometimes. Good luck with the open garden. Much prettier than anything I've ever seen at a funeral! 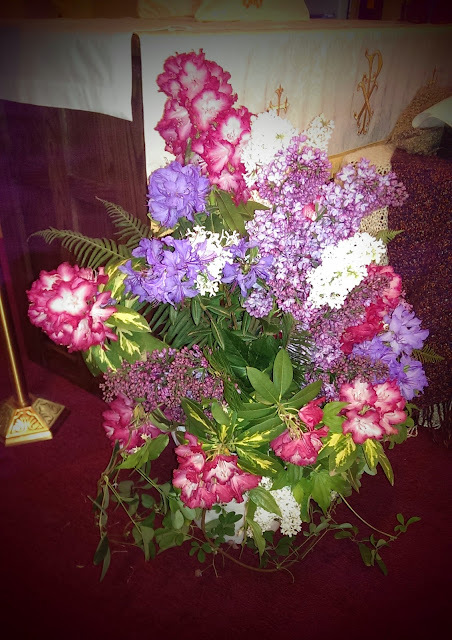 Wednesday Vignette -What is That? Wednesday Vignette - Clever Design. So, What's Happening in My Garden? What's Jumping at Jungle Fever?